If communication is the key to success, smart communication is pivotal to your brand’s prosperity. Thinking outside the box is necessary at a time when the attention spans of your potential customers are shorter than ever. 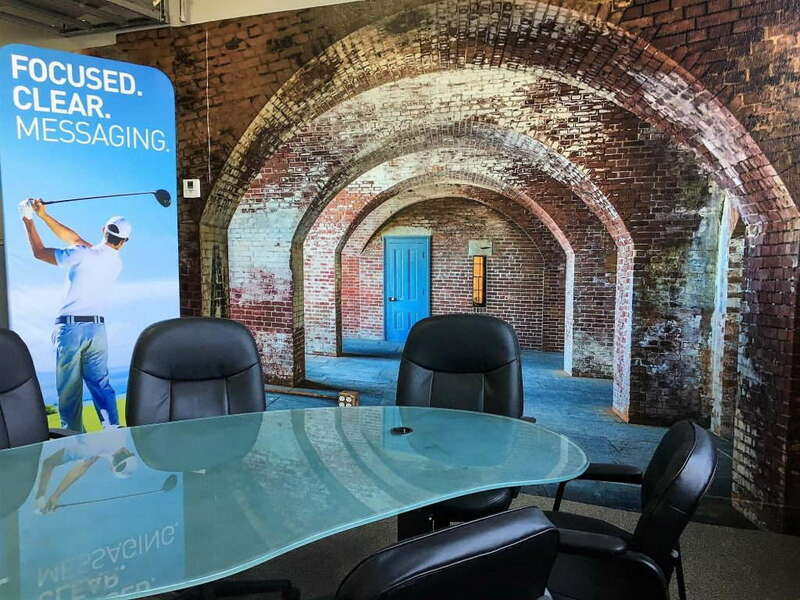 SpeedPro Imaging, the nation’s leading large format graphics franchise, wants to help you stay ahead of the curve with experiential graphics as content delivery becomes just as important as the content itself. Experiential graphic design uses technology, form and traditional graphics to reach your intended audience on several different levels. Colleges and local municipalities have incorporated experiential graphics to immerse students/visitors and elevate the environment. Same goes for corporations trying to attract employees/clients and event planners seeking to deliver a next-level experience. 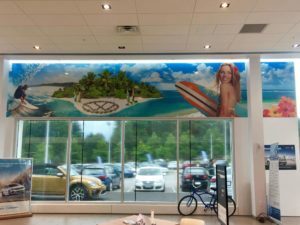 Mark Simmons of SpeedPro Imaging Apex, NC, helped coordinate stunning displays at a local auto dealership in NC that directly generated sales and improved company culture. 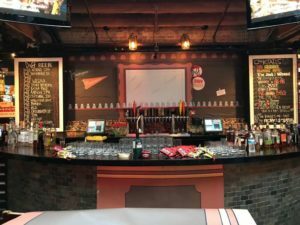 Shira Kollins of SpeedPro Imaging Chicago, has received praise for incorporating experiential graphic designs to produce game-changing results for multiple clients, including Moe’s Bar – a real-life replica of the Simpsons’ watering hole. And Steve Moran-Cassese of SpeedPro Imaging Marin, CA is an early adopter of experiential graphics. 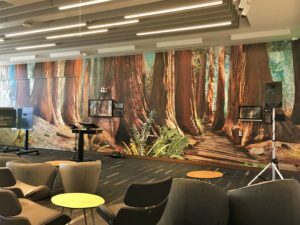 He calls it the fastest-growing market segment, and he has a reputation in the Bay Area and beyond of delivering awe-inspiring results – like this fantastic piece for HP’s headquarters. If done right, your message will be received loud and clear. So why not do it with a little added flair? With experiential graphics, you can direct visitors to your business while educating, communicating and impressing. Let your message turn into a conversation starter through innovative visual stimulation, with content that will have your guests flocking to show it off in social media selfies. 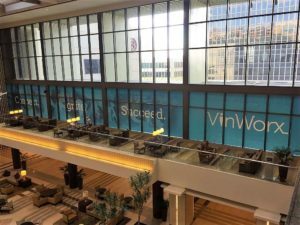 Experiential design takes many forms – signage, exhibit design, architectural graphics, and now more than ever, digital technology. Each holds the ability to integrate multiple elements and give your brand life. Sure, you want the graphics to be useful, but don’t fumble away the chance to immerse your clients in an unforgettable experience. The ability to leave your customers in awe and give them something to tell their friends about is well worth the price of admission. Not convinced? The graphics are designed to enhance your creative side. And if creativity comes with a strict budget, that’s not an issue. No one will notice how much you didn’t spend, if you do it right. Get the most of your setting. 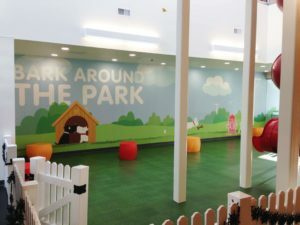 Whether it’s a picturesque park, a food court or a parking garage, the possibilities to turn drab into dramatic is limited only by your imagination. While some might consider a rogue door or vent an obstacle, we envision it as an opportunity to present your brand in a unique and memorable way. The new kids on the block aren’t settling for the status quo. They’re expecting creative workspaces. They’re expecting an engaging environment. There’s no need to bury your head in the sand. Experiential graphics inspire a different energy and attitude that make employees, of all ages, better than ever! Your future begins now. Let SpeedPro Imaging show you the way to success. 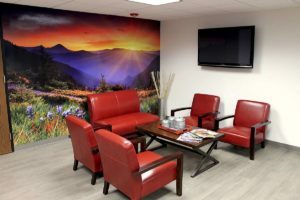 For more information about SpeedPro Imaging, the nation’s leading large format graphics franchise, and to contact your local SpeedPro to get started, please visit speedpro.com/find-a-studio.